What is Jazz ? It's a music style ? It's the same as blues ? Many ask these questions, but only a few unfortunately know the true meaning of Jazz ! Jazz is not a style or any kind of. Jazz is music; the true, honest, sincere and free way to play it. Through jazz you can play any "kind" of music (rock,pop,bossa-nova,country,classical,blues,....). With Jazz the musician can put and bring his/hers best. But to embrace Jazz, the artist must be strong and loyal to his/hers art-form, must be at the top of their playing, because having the freedom to create music, is one the great pleasures in life. For us listeners/aficionados/consumer, is just the opportunity we have, to be amazed and unsure of what the next note will be, for this note, is giving us the chance of hearing a moment of bliss, that is translated to ( a now famous by my great jazz mentor Mr. Bob Barroso ) EARGASM !!!!! Well, one of the ways to experience the beauty and freedom of Jazz/music, are the recordings made live at Maybeck Recital Hall. 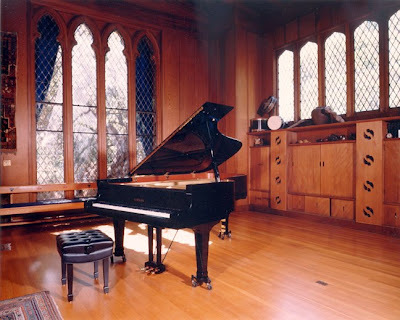 From 1990 to 1996, there were 42 Pianists playing at the same place, same piano ( Yamaha S-400B and C7-FII on some Duo recordings ) and on different dates. No artist sounds tha same or even the piano sounds the same, one completely different from the other. This is music, this is Jazz ! No one can label the beauty of these recordings. Beside all this great 42 CD's released by Concord Jazz, they recorded 10 more entitled: Concord Duo Series, at the same magnificent place, everyone produced by the late Carl E. Jefferson. I do urge everyone, to ask Concord Jazz to re-release all 52 recordings and it's true legacy to music, to JAZZ !